The CMYK Color Profile determines the ratio of the mixture of Cyan, Magenta, Yellow and Black with which individual colors will be represented on paper. Depending on what color dyes you or your printing office use for printing on which paper, different color profiles are more or less suitable: For “coated” paper it is recommended to choose a color profile with the suffix “Coated” and for “uncoated” paper, a color profile with the suffix “Uncoated’. The most regularly used color profiles in Central Europe, for instance, are the “Euroscale” profiles. If you are not quite sure which color profile is the most suitable for your purposes, simply contact your printing office. 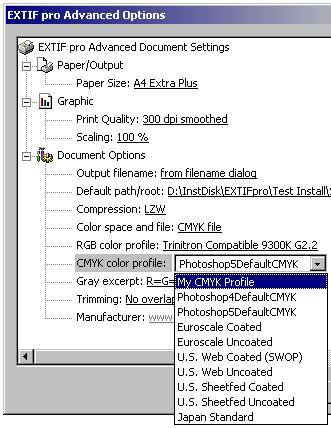 EXTIF pro by default provides the 7 most common CMYK color profiles – in case you furthermore wish to use other or own color profiles, then please just copy the corresponding *.icc files to subdirectory „User CMYK Profiles“ of installation folder „EXTIF pro“ and open the Property Pages again.